Whisky Joe: Swept Away: A review of Dave Broom's "The World Atlas of Whisky"
Swept Away: A review of Dave Broom's "The World Atlas of Whisky"
This week's post is a bit different. Rather than reviewing a whisky, I'm reviewing a book with a wider appeal than any whisky could ever hope to possess. Many whiskies have a polarizing effect on drinkers (Ardbeg, Johnnie Walker Blue Label), but this book will appeal to all, even those who don't drink whisky. Dave Broom's stated goal when writing this book was to survey the world's whisky landscape. 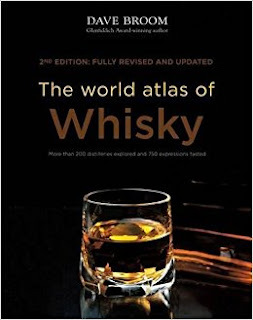 He provides the reader with information on the various whisky-producing regions, the different processes used for distilling whiskies and even tasting notes for hundreds of whiskies. While my edition of this book contains some out of date information, it's impossible for any book to be completely current. The whisky landscape is ever-changing and it's impossible for print to keep up. Before reading a single word M. Broom has written, take the time to leaf through this book and admire the photography. I realize it doesn't tell you anything about whisky, but it speaks to the caliber and quality of this tome. If the photos don't stir up your wanderlust, especially the photos of Islay, Ireland and Japan, M. Broom's prose certainly will. The section on "terroir" moves beyond whisky and into the realm of identity and, dare I say it, philosophy. I realize that M. Broom has a team of editors working with him, but this is simply great writing. Should you doubt his talent, spend some time watching this video (opens in a new window) of Dave Broom explaining some history and guiding a group through a whisky tasting. The man knows his stuff. One of my favourite features of this book is the flavor map. 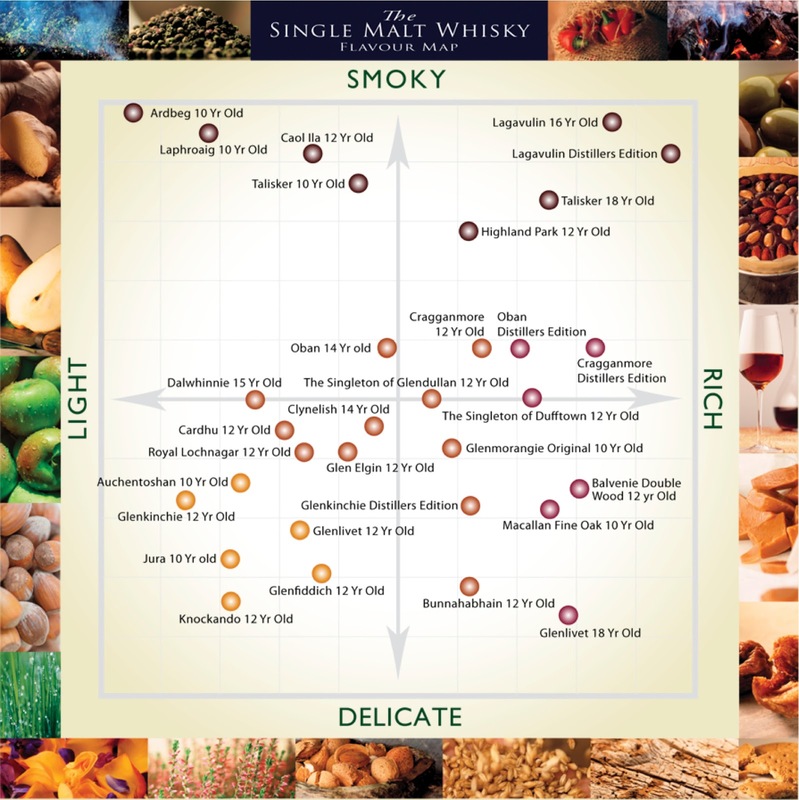 Developed with a group of distillers, the flavor map (my edition of this book adheres to American spelling conventions) helps those new to whisky describe, in broad categories, the flavour characteristics of whisky. It also helps you map out your preferences. The x-axis (East-West) goes from light to rich and the y-axis (North-South) goes from delicate to smoky. In his description of whiskies, the author refers to the map by describing which "flavor camp" a particular whisky falls into. For example, if you read the description of Lagavulin 16 Year Old (my personal favourite), you'll find it in the "Rich and Smoky" flavor camp. The Glenomorangie Original 10 Year Old is close to the center, but slightly on the rich and delicate side. Neither quadrant is "better" than any other. The graph is simply a useful reference point. 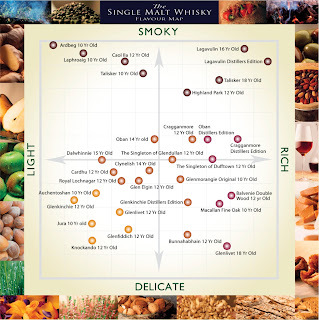 Each whisky is categorized into a flavor camp even if it is not represented on the visual map. The author has taken it upon himself to act as your guide. The book begins with some clear, well-explained diagrams of the various distillation processes of the world's different whiskies. This makes for some interesting comparisons and allows the reader to better understand their favourite drink. In every section (and even sub-section in the case of Scotland), you get a bit of a history and geography lesson on the region as well as the distillery. This helps you better understand and enjoy whisky. A whisky is not simply a product, but an expression of time, place and yes, identity. Japanese distillers were strongly influenced by the Scottish distillation process (the first two Japanese distillers, Masataka Taketsuru and Shinjiro Torii, completed apprenticeships in Scotland in 1918) but Japanese whisky is not mere imitation. It reflects the Japanese fusion of old and new, of respecting tradition while championing innovation. Full disclosure: I've never tasted a Japanese whisky, much to my chagrin, but after reading the section on Japan, I could almost smell the aromas and taste the flavours of Hakushu, Yamazaki, Nikka, and Hibiki., such is the strength of M. Broom's writing. As much as I'd like to visit the Land of the Rising Sun, it won't likely happen any time soon. This chapter certainly furthered my interest in trying their whisky, if nothing else. Broom goes beyond description and recommends a "next step" at the end of each series of tasting notes. For example, if you read his description of the Talisker 10 Year Old (an absolutely wonderful malt), you'll notice that his recommendation for "where to next?" is Springbank 10 Year Old (another delightful scotch). These malts share similar characteristics. This thoughtful feature allows you to build and develop your palate while knowing you won't be too shocked by what you find. Someone who has tasted naught but Glenfiddich 12 would undoubtedly feel overwhelmed by a Laphroaig 10 Year Old (aptly described on their site as a "Peaty Slap in the Face"). Someone who enjoys something as smooth as Redbreast 12 Year Old Irish Whiskey might be put off by the spicy rye flavour of Alberta Premium. Dave Broom's encyclopedic knowledge is here to guide you along. 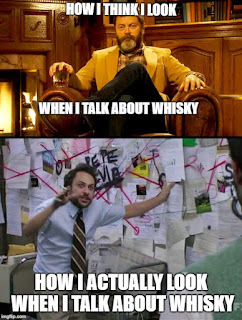 Whisky can be intimidating and confusing. Many want to try it, but don't know where to begin. Not only has Dave Broom included a "How to drink whisky" (really) section in his book, but his hints and advice guide you seamlessly through your journey. Even those who don't like uisge beatha ( roughly pronounced ooska va) will find the history and descriptions fascinating, informative and eminently enjoyable. If you only purchase one book about whisky (and you should have at least one) it should be this one. Highly recommended.